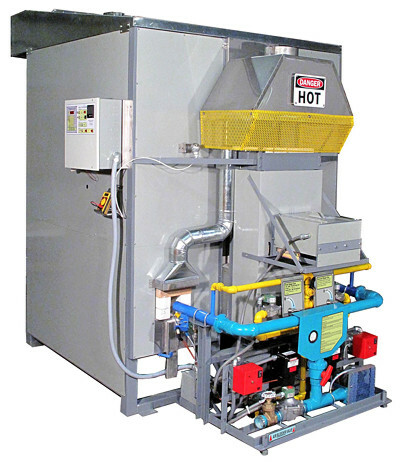 Computer controlled gas kilns are less expensive than in the past. There is no better way to start serious production of high quality ware. Glorious Cone 10R Using Ravenscrag Slip! Are you serious about the production of high quality ware? Nothing beats cone 10R! It is good for quality and business. 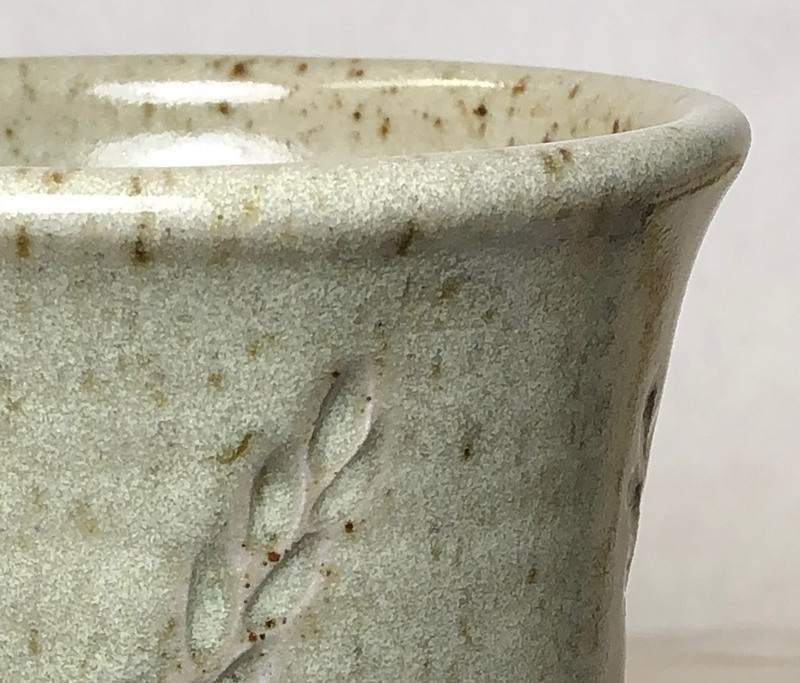 Native materials: Glazes melt so much easier, so you can use raw and native glaze materials (gone are frits, borates and other low-melting and expensive materials). Ravenscrag and Alberta slip melt by themselves at cone 10. Quality: Porcelainous and white stoneware bodies are so strong and the glazes have higher silica and alumina so they are harder. Porcelain and whitewares fire blue-white instead of yellowy-white. It is the home of the most magic oxide in ceramics: iron. Only at Cone 10 reduction is iron a powerful glaze flux, variegator and crystalizer, a colorant of many characters in bodies and glazes and a speckling agent like no other. And it is safe and cheap! Cone 10 raw flux-sourcing materials are much less toxic. Cone 10 bodies can have higher clay content, and therefore be more plastic (because less feldspar is needed). 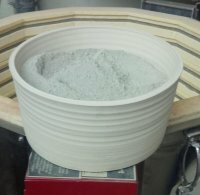 Glazes also need less flux so more clay in the recipe means better suspension and hardening. The easiest mechanism to produce mattes lives at cone 10. Trying to crowbar magnesia or dolomite mattes lower using fluxes like boron glosses them, and the incredible soft silky surface is lost. Other lower fire matte mechanisms are fragile and trouble prone. 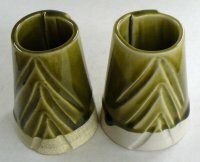 There is no aesthetic that can match cone 10R in porcelain or stoneware. Firing consistency and cost: There are no kiln elements that deteriorate over time and fire slower, an old kiln fires the same schedule as a new one. Gas is cheaper than electricity and gas kilns can fire alot faster and this can more than compensate for the higher temperature (in industry fires are measured in minutes, not hours). There is much less crazing at cone 10 because the glazes, by necessity, have much less high expansion fluxes and more low expansion silica and alumina. There is little need to rely on complicated flux interactions to make things melt, the temperature does it all. 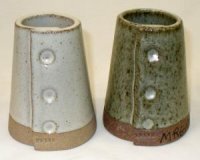 There is a closer relationship between what the glaze chemistry suggests will happen in the kiln and what actually does happen. A good automatic firing cone 10R kiln. Make your glazes from Ravenscrag and Alberta Slip so you only need to stock a minimum of materials. 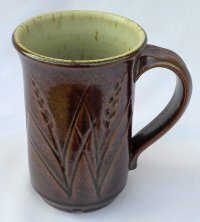 Plainsman clay bodies: No one on the planet makes better cone 10R native stonewares. 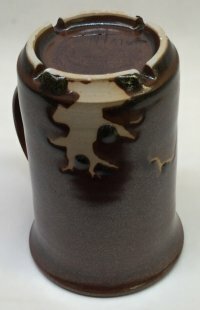 Ravenscrag by itself fires to an excellent cone 10 glaze, especially as a silky matte base. For functional glaze, consider testing for leaching, crazing and cutlery marking. A celadon recipe containing only two ingredients. It affords slurry and drying control because proportions of raw and calcined materials can be varied. This is a celadon that you can tune to your needs. It works well on dark and light stonewares and porcelains. Adjust the proportions of Alberta Slip to Ravenscrag Slip to fine tune the color (more Ravenscrag for lighter color). Adjust the amount of frit to tune the amount of gloss and melt fluidity. Calcium carbonate also works, but may produce more bubbles floating in the matrix. If you fire to cone 11, then no flux may be needed. You can fine tune the thermal expansion (e.g. frit 3134 for higher expansion, 3249 for lower, 3124 for nuetral). 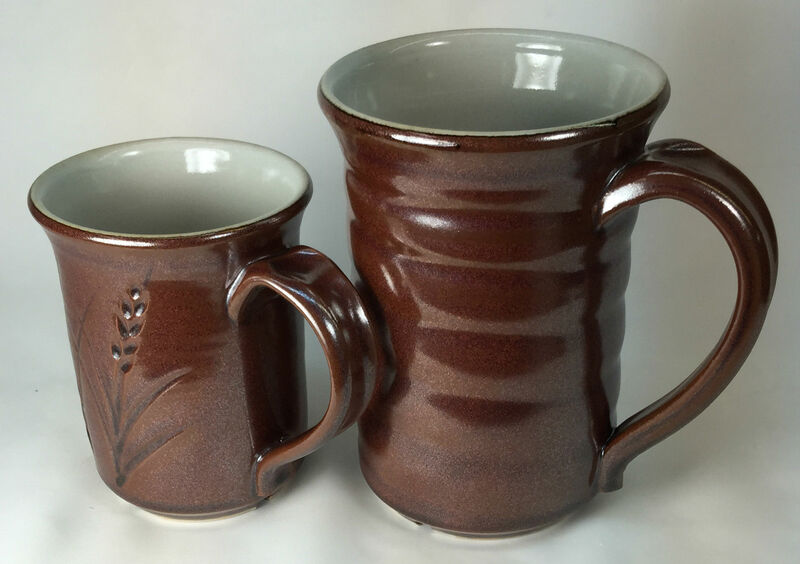 Since this glaze is 90% clay, you will need to calcine half of the Alberta Slip complement to reduce the drying shrinkage if it will be applied to bisque ware (if applied to leather hard ware it should be OK as to use pure raw Alberta Slip). 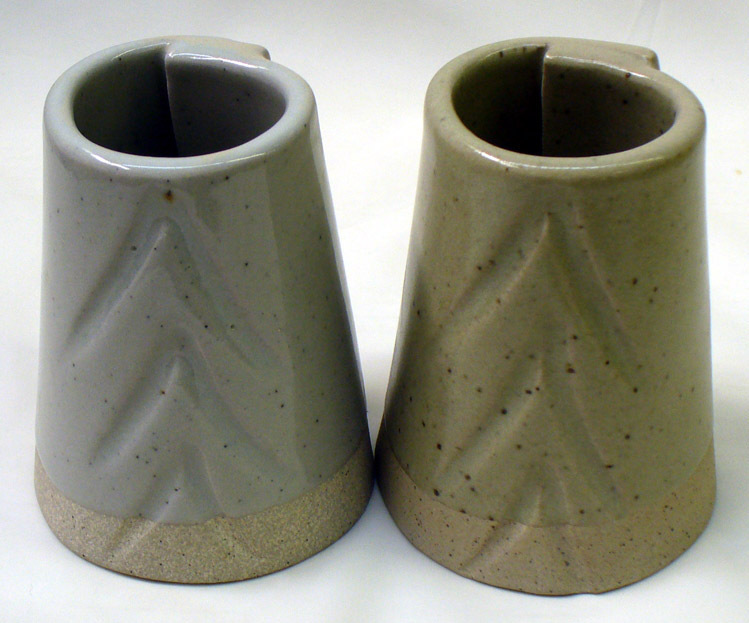 (50:50 Ravenscrag Slip:Alberta Slip) at cone 10R on porcelain (right) and stoneware (left). At cone 10R this produces an overly melted glaze. It also crazes. On a white stoneware and a porcelain. 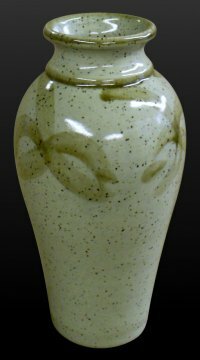 The glaze is transparent, it has depth and varies in shade according to thickness, breaking to a much lighter shade on the edges of contours. 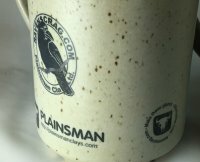 The outside glaze on this cone 10R mug (made of Plainsman H550) is simply an Alberta Slip:Ravenscrag Slip 50:50 mix with 5% added Ferro Frit 3134 (the Alberta Slip is calcined). 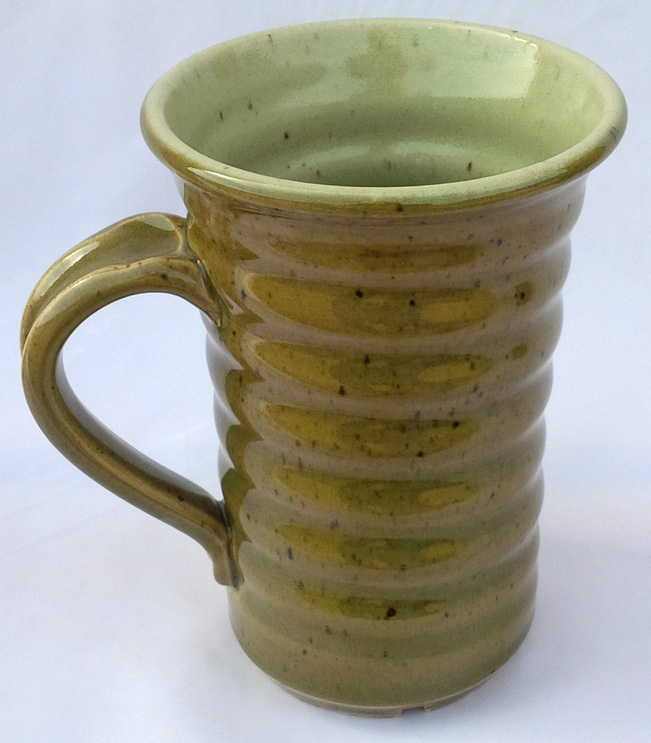 This produces a stunning celadon with great working and application properties. 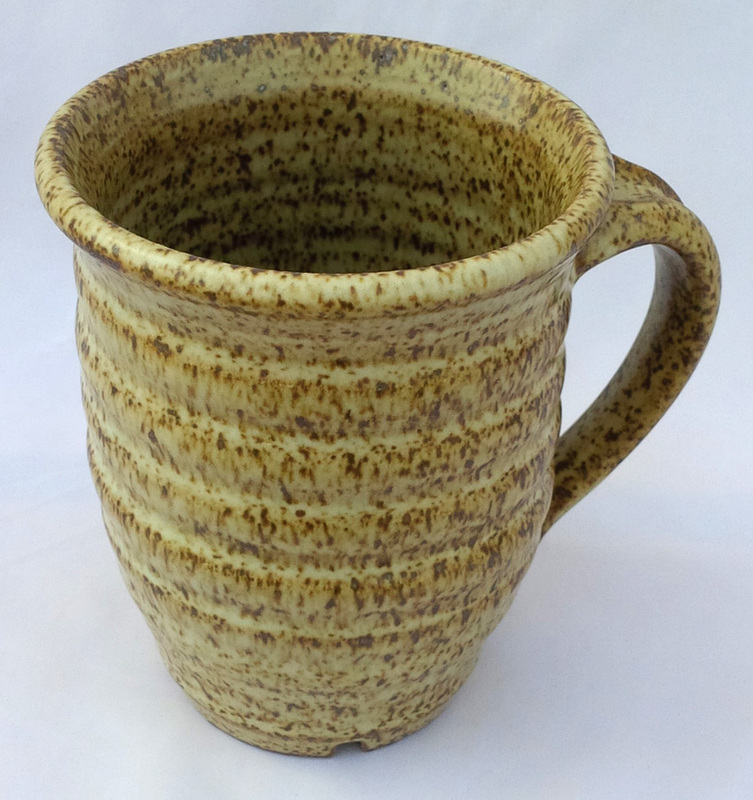 Inside glaze: Ravenscrag Slip 90%, talc 10% (a matte having an extra ordinary silky texture). Learn more at ravenscrag.com. 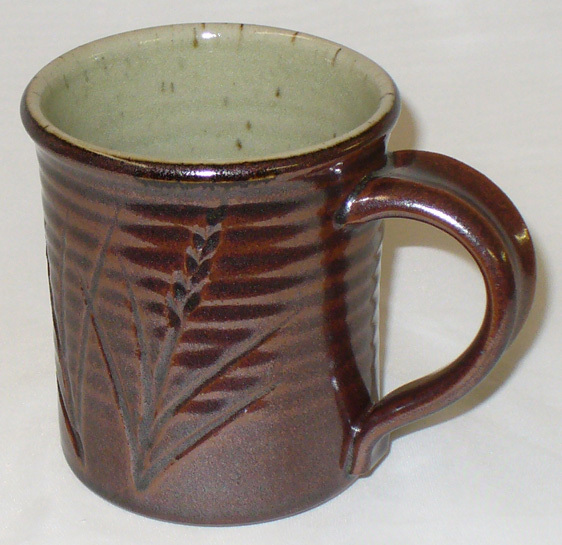 Ravenscrag Slip is a revolutionary glaze material for stoneware. At cone 10R it can be used pure and produces a functional semi-gloss surface. The possibilities are endless on what you can do by adding things to this base material. You can make additions to gloss it or matte it more, color and variegate it and/or opacify it. Most will contain 90% Ravenscrag (you can make bamboo, tenmoku, celadon, iron crystal, white, matte, glossy, and much more). Ravenscrag Slip is a clay, so it shrinks. We recommend starting a 50:50 raw:roast mix in recipes that call for a high percentage of the material (use the roast instructions at http://ravenscrag.com). Adjust the proportion to get the fastest drying possible while still drying hard and having good slurry suspension. Ravenscrag glazes resist settling in the bucket and go on even (when mixed correctly). Glazes having a high percentage of Ravenscrag Slip are most often prepared using the traditional method of simply adding water until the preferred viscosity is achieved (the material has inherent properties that produce functional slurries for dipping). Control of drying shrinkage and slurry character is achieved by varying the proportion roast and raw powder in the recipe. For us, a weight ratio of 88 water to 100 powder (2200 tap water for 2.5kg of powder) produces a creamy slurry that gives the right thickness on 1-2 second dip on 1850F bisque-ware (with minimal dripping), it has 1.45-1.47-specific-gravity. Using your water you will likely find some variation in this. This recipe actually does not respond to flocculant additions that gel traditional mineral-blend glazes to a thixotropic state. 3000 grams of powder mix makes about 1 Canadian gallon. This is the Ravenscrag Slip I used to calcine at it 1850F (about 10lbs in a bisque vessel). I am now roasting it to 1000F instead, this produces a smoother powder, less gritty. I hold it for 2 hours at 1000F to make sure the heat penetrates. It is not actually calcining, since not all crystal water is expelled, so we call it "roasting". Why do this? Ravenscrag Slip is a clay, it shrinks. If the percentage is high enough the glaze can crack on drying (especially when applied thickly). The roast does not shrink. The idea is to tune a mix of raw and roast Ravenscrag to achieve a compromise between dry hardness and low shrinkage. Technically, Ravenscrag losses 3% of its weight on roasting so I should use 3% less. But I often swap them gram-for-gram. This picture does not fully convey how much better the Ravenscrag is as a liner (vs. G1947U). It has depth and looks much richer. It course, it could be opacified somewhat to be whiter and would still retain the surface quality (as long is it is not too opaque). The body is Plainsman H450. 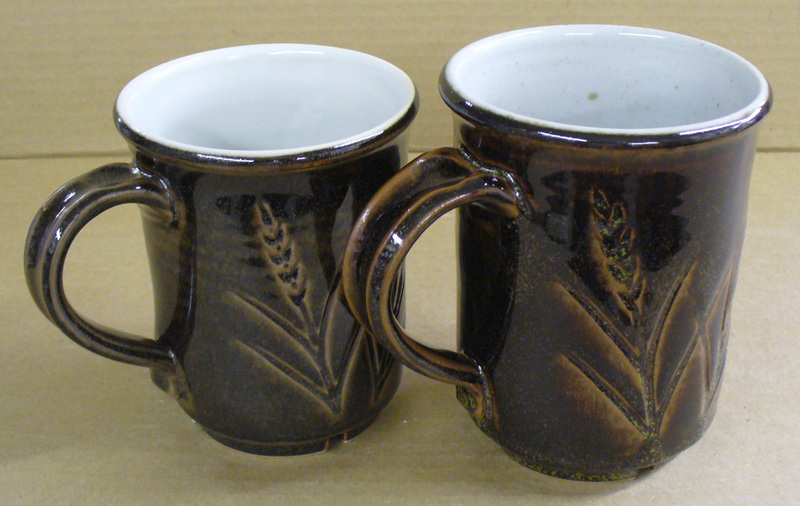 The outside glaze is pure Alberta Slip. 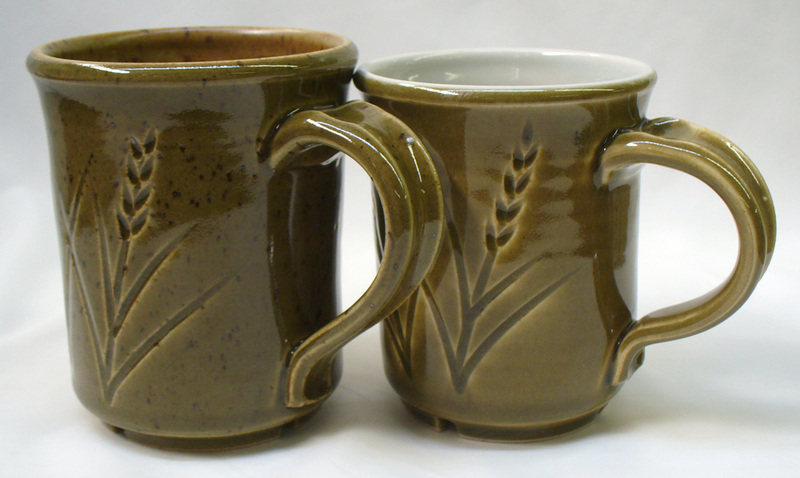 Left two mugs are glazed with pure Ravenscrag Slip (roast:raw combo), far right one is RavenTalc silky matte (GR10-C). 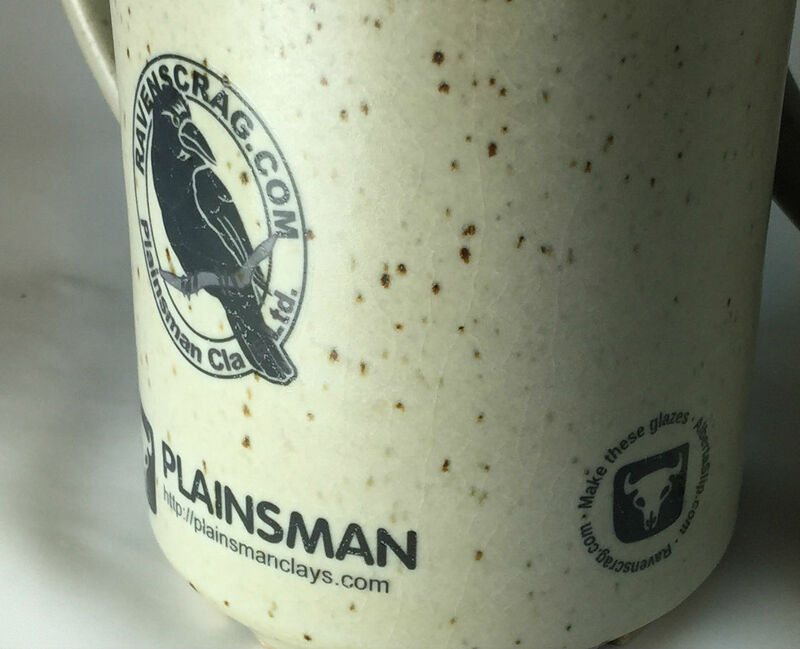 The speckled mugs have 10% of Plainsman FiredRed (a concretion-containing red fireclay). 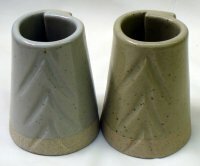 B-Mix is a popular high-ball clay very plastic grey cone 10R stoneware in North America. 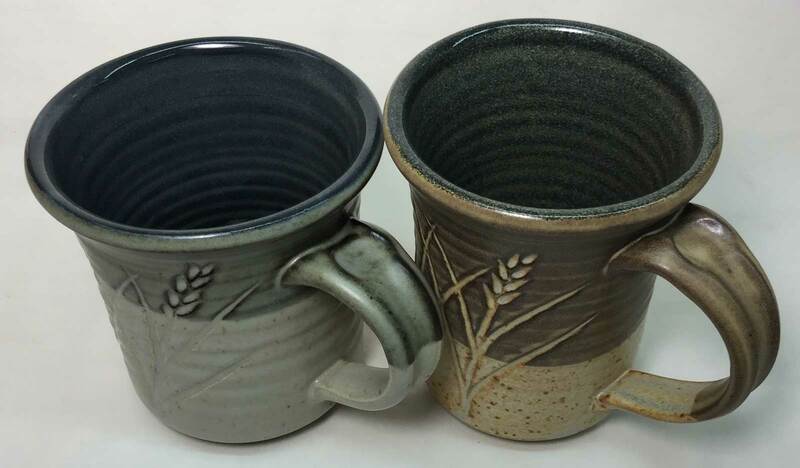 The two mugs on the left have pure Ravenscrag Slip on the inside (the middle on the outside also), it fires almost transparent with a slightly silky surface. Pure Alberta Slip is employed on the outside of the left one and the inside of the right one. The outside of the right one is RavenTalc silky matte. In all cases the Ravenscrag and Alberta Slip are mixed half-and-half calcined and raw. B-Mix fires dark enough and with enough specks that a normal transparent glaze is not very interesting. But these Ravenscrag ones look much better (for liner glazes). 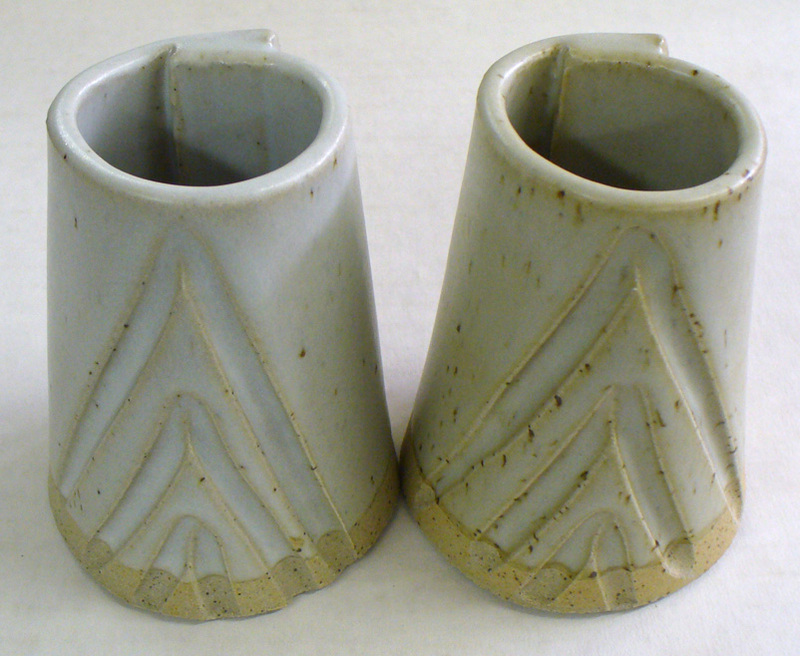 Pure Ravenscrag Slip on a porcelain at cone 10 oxidation (left) and cone 10 reduction (right). 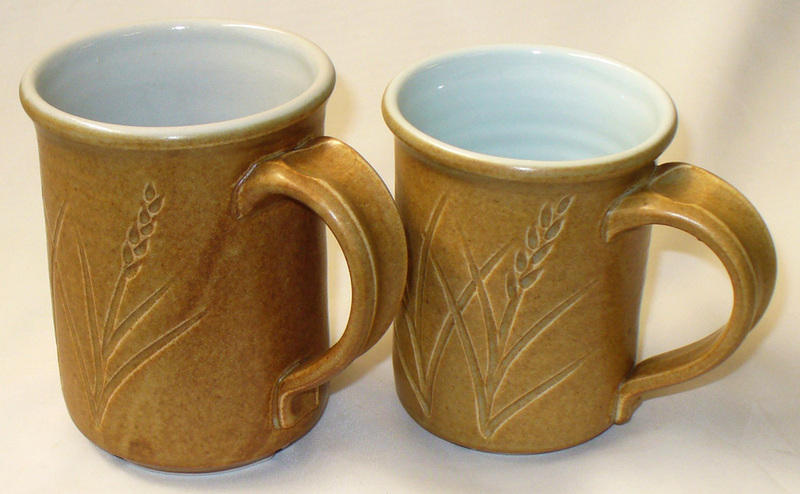 The reduction fired sample is a very smooth pleasant semi-matte, the other is glossier but dimpled. 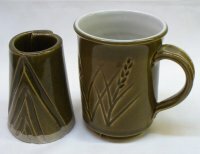 This is a buff stoneware clay. Crystal development toward a dolomite matte begins at 15%. By Kat Valenzuela. 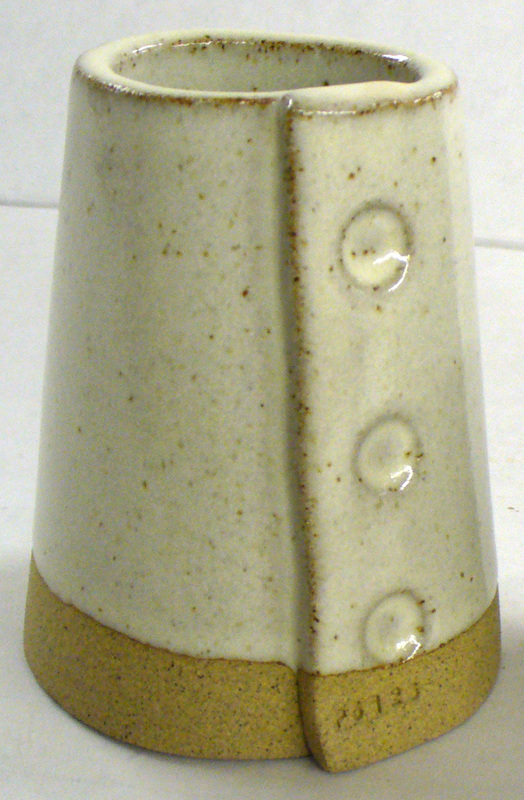 2,5,10,15% talc added to Ravenscrag Slip on a buff stoneware fired at cone 10R. Matting begins at 10%. By Kat Valenzuela. 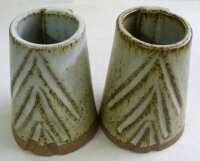 2, 5, 10, 15% calcium carbonate added to Ravenscrag Slip on a buff stoneware fired at cone 10R. It gets progressively glossier toward 15%, crazing starts at 10% (test by Kat Valenzuela). Adding a flux only reduces the SiO2 and Al2O3, this pushes the thermal expansion upwards. 5% is actually sufficient. An alternative would be to use wollastonite, it supplies SiO2 also. The surface is between silky and glossy. Ravenscrag Slip is not ultra glossy but has a silky surface. It also contains some iron oxide and this colors the glaze somewhat. But the surface is much less sterile and pleasant to touch. Fired cone 10R. The one on the right contains 10% of Plainsman A1:St Rose Red mix to add speckle. This is GR10-J dolomite matte (a Ravenscrag version of G2571A) with 1% iron oxide added (to produce a bamboo effect). An alternative bamboo (for both this and the G2571A recipe) is to add 3.5% rutile and 10% zircopax. Make cone 10R bamboo colors using the GR10-J Ravenscrag silky matte base recipe (right) and adding 1% iron (left), (0.5% centre). These samples are porcelain. This iron addition also works using the G2571A matte base recipe. 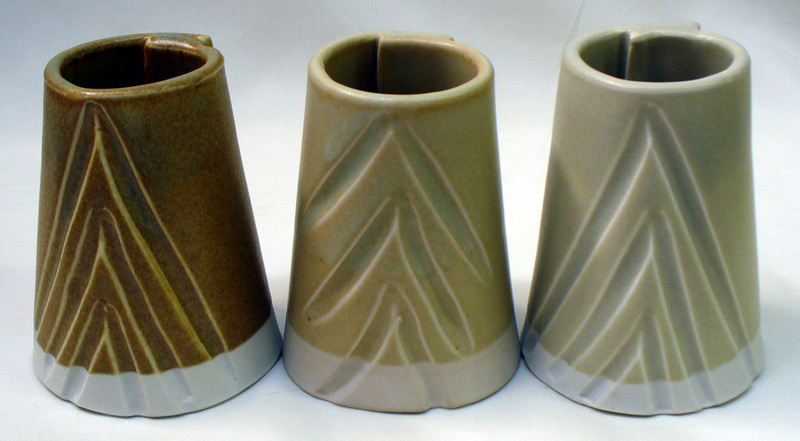 Porcelain (left), buff stoneware (center), iron stoneware (right). Works well on all body types. On porcelain, interesting red tones and variations in tone appear. The stunning cone 10R Ravenscrag bamboo glaze (GR10-J plus 0.5% iron oxide) on a Grolleg porcelain. Up close it can feel and look like a fine wood surface (when used on a porcelain). The cone 10 recipes page at Ravenscrag.com has more info. Two cone 10R bamboo glazes. One stains, one does not. Why? 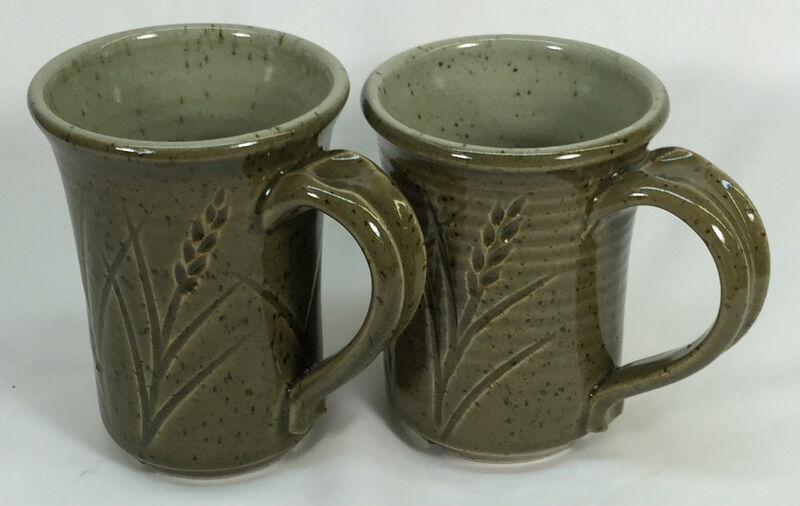 These mugs are Plainsman H443. 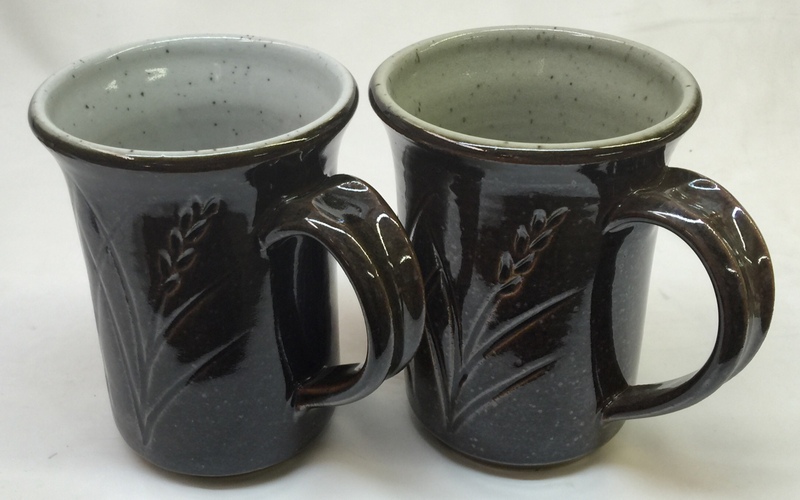 The bamboo glaze on the left (A) has 3.5% rutile and 10% zircopax added to the base G2571A dolomite matte. The one on the right (B) has the same addition but in a base having slightly less MgO and slightly more KNaO. B stains badly (as can be seen from the felt marker residue that could not be removed using lacquer thinner). Why does A stain only slightly? It has an additional 4% Gerstley Borate (GB). GB is a powerful flux that develops the glass better, making the surface more silky. The differences in the recipe provide another advantage: A has a much lower thermal expansion and is less likely to craze. This is the classic cone 10 reduction silky white matte, its feel, beauty and utility are very difficult to match in any other system. Unlike many feldspar saturated dolomite mattes in use, this one does not craze on stonewares and it does not cutlery mark or stain. 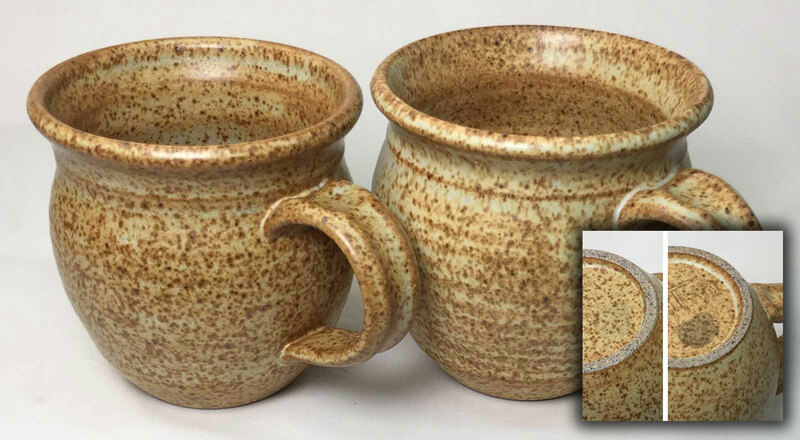 This glaze was developed from the popular G2571A, it has the same chemistry however it sources that chemistry from a completely different recipe based on Ravenscrag Slip (this is a good example of how Insight ceramic chemistry software can be used). The pleasant silky surface is almost identical (though slightly darker in color due to a little higher iron content). Add a little zircopax (e.g. 3-5%) to whiten the color if you desire or if you need to precisely match the G2571A. This glaze has the characteristic superb application and suspending properties of Ravenscrag Slip glazes. Note that the calcined kaolin is important. If you use raw kaolin, the glaze will shrink too much during drying. For a slip glaze, raw kaolin would be OK. If you do not have the Boraq (Gerstley Borate substitute) then you can substitute real Gerstley Borate or another equivalent. The two most common variations are bamboo and robin's egg blue (see photos here). Mar 2015: We have found a tendency for this glaze to craze on some stonewares after decal firings. See the linked picture. Robin's egg blue at Cone 10R: add 1% cobalt oxide and 0.2% chrome oxide to GR10-J Ravenscrag silky matte. Does not work well on porcelains (left), very well on buff stonewares (right). Inside of center mug is GR10-J. GR10-J Ravenscrag dolomite matte base glaze at cone 10R on Plainsman H443 iron speckled clay. This recipe was created by starting with the popular G2571 base recipe (googleable) and calculating a mix of materials having the maximum possible Ravenscrag Slip percentage. The resultant glaze has the same excellent surface properties (resistance to staining and cutlery marking) but has even better application and working properties. It is a little more tan in color because of the iron content of Ravenscrag Slip (see ravenscrag.com). Just Ravenscrag Slip plus 10% talc produces a visually variegated surface that feels silky and looks stunning! This glaze is more silky (less matte) than the GR10-J glaze, it is more beautiful visually and to the touch than a photo can convey. It works well on both buff and dark stonewares and even porcelain. It would also be an excellent base for the addition of a zircon opacifier and of colors. For mixing instructions please see the notes for the base GR10-A recipe. GR10-C Ravenscrag cone 10R silky matte glaze closeup (on Plainsman H550 stoneware). The recipe is 90% Ravenscrag Slip (roast:raw combo) and 10% talc. The inside of this piece just has pure Ravenscrag (raw:roast). 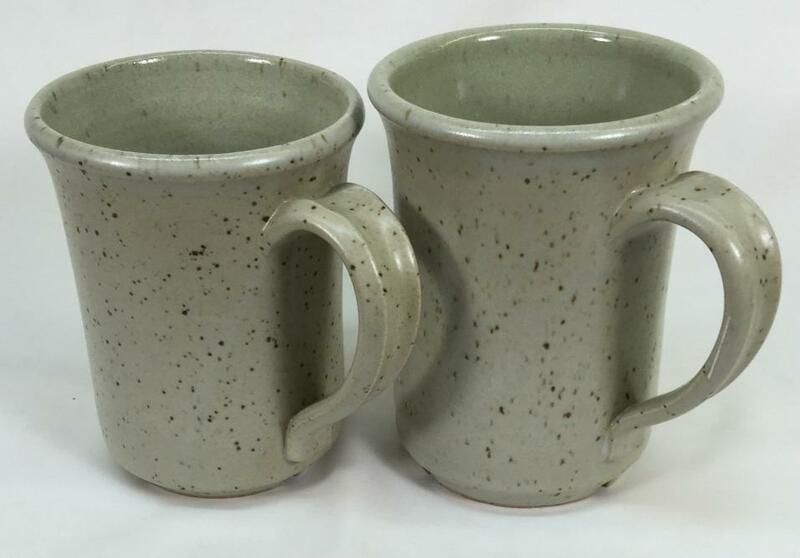 Same body, same glaze. Left is cone 10 oxidation, right is cone 10 reduction. What a difference! This is a Ravenscrag-Slip-based recipe on a high-fire iron stoneware. In reduction, the iron oxide in the body and glaze darkens (especially the body) and melts much more. The behavior of the tin oxide opacifier is also much different (having very little opacifying effect in reduction). Fired at cone 10R. The GR10-C Raven-Talc matte is just 90% Ravenscrag Slip and 10% talc. This produces a stunning silky, variegated surface (which could be a base for many colorants). 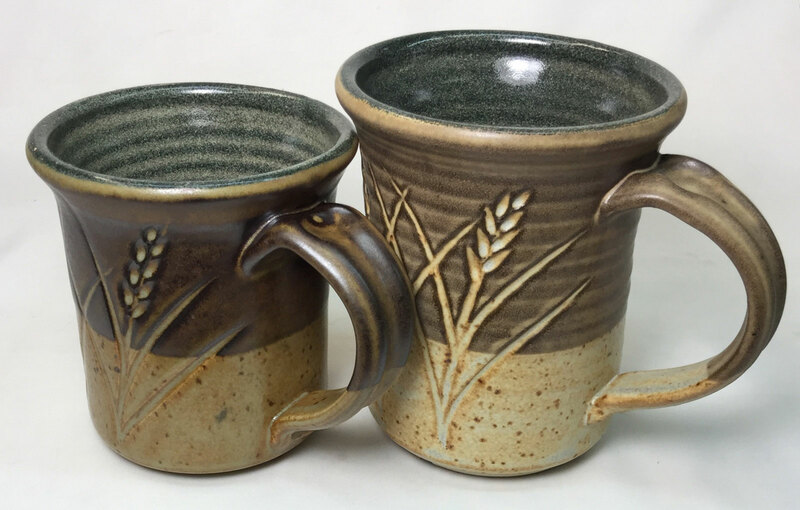 The GR10-J Raven-Dolomite matte was patterned after our G2571A glaze, but using as much Ravenscrag Slip in the recipe as possible while maintaining the same chemistry (its surface is less variegated and more matte). Clay is Plainsman H450. The L3954N black engobe was applied at leather hard stage (on the insides and partway down the outside). The G1947U clear glossy glaze over it on the inside produces a deep and vibrant hue (left). 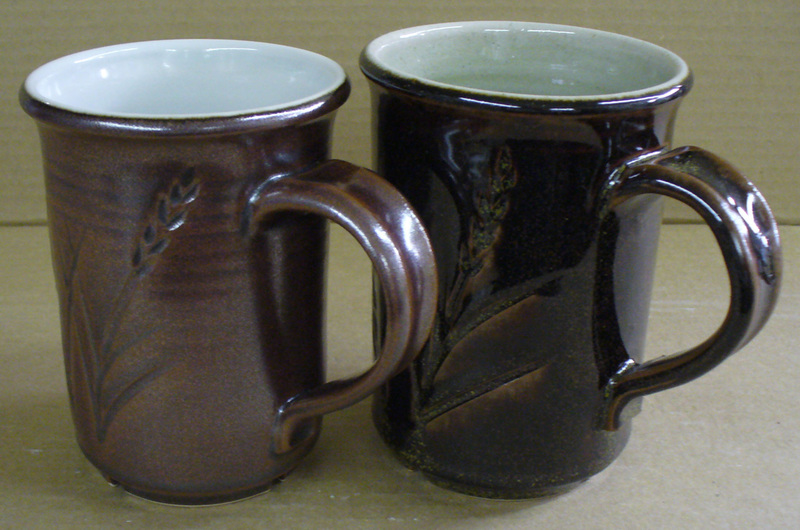 The inside glaze on the right is GR10-C Ravenscrag silky matte. The outsides are GR10-J Ravenscrag Dolomite matte with a little added cobalt and iron (for blue and brown).